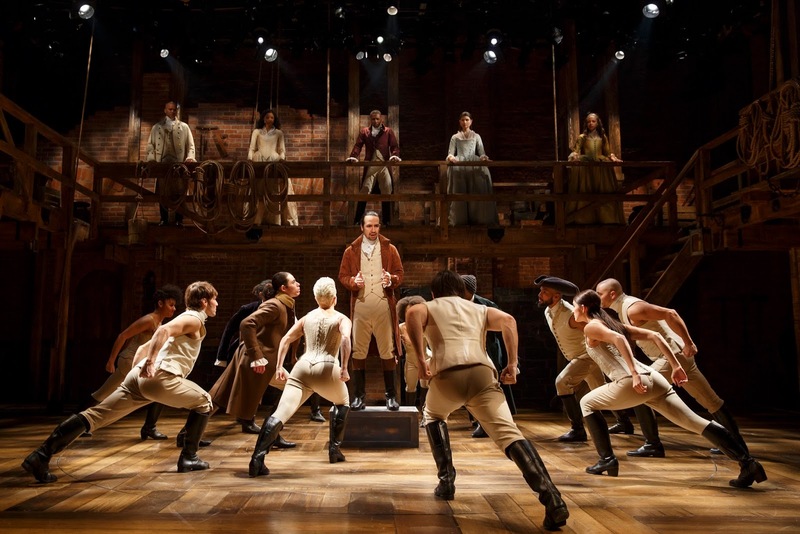 Lin-Manuel Miranda, center, as Alexander Hamilton in the musical, "Hamilton." Photos by Joan Marcus. ALEXANDER Hamilton was America's first-ever treasury secretary. If that sounds a tad dull, you haven't been listening to the buzz around Lin-Manuel Miranda's breathtaking bio-musical of the Founding Father. All that buzz preceded "Hamilton," – at the Richard Rodgers Theatre in an open run – from its wildly acclaimed start at The Public Theater where it premiered earlier this year. "Hamilton" is a brilliantly intelligent musical. It riffs on the large canvas of the American genesis with humor and insight. It tackles a big swath of history and wraps it in an unconventional mode. (See video below). Not to mince words, there are not enough superlatives to throw at this production: it is simply perfect – almost, anyway. Inspired by Ron Chernow's biography, "Alexander Hamilton," L-MM frames the story of America's genesis in period costume (by Paul Tazewell, with hair and wigs by Charles G. LaPointe and sets it to a hip-hop and popular beat. The rhythms of our country's road from revolution to burgeoning democracy are modern and filled with references from Gilbert&Sullivan to Sean Combs.